We've all heard of the brand. They have hair products for all!They also have Footbaths and Hair trimmers. I received the Infiniti Pro Hair Dryer. It's an 1875 watt and I'm generally happy with it. First of all, I love the color. Orange is awesome and I can easily find it if it's at the bottom of my drawer. Secondly, this dryer replaced an older Conair 1875 watt dryer. I loved that thing. It was small but powerful. We got it at Target for $20 and it lasted us 3 years. In fact it still works. Thing was great!! This is more powerful and because of that it knots my hair up faster. When my hair is done being dried it needs to be brushed, with the old dryer that didn't need to happen. I rotate between my dryers now and I do like this one. I just need to take that extra step in brushing. Also for them both being an 1875, I don't know how it's possible, but this dryer takes me about 5 minutes longer... So I'm not sure why. I don't use diffusers that often, but I do like these, they give me more of a direct dry then all over the place. They do cut down the time a bit as well since you're not wasting air blowing behind and in front of you. Another thing I liked about my old one, is it folded up. The handle flipped right under the main part and then I wrapped the cord up, so it took a LOT less space in my drawer than this one does. But I needed a change and I think this was the right step. Conair has so many items for so many different tastes and I like that in a company. I don't like when a company specializes in just one type of product. I like Conair! Price: The Dryer I received is $39.99 it's nice and worth it! I'd like to try the Xtreme Instant Heat™ Multisized Hot Rollers! I like the Infiniti Styling Iron. I had no idea that conair had so many different items that aren't personal care related. It is a travel step ladder and hand cart. 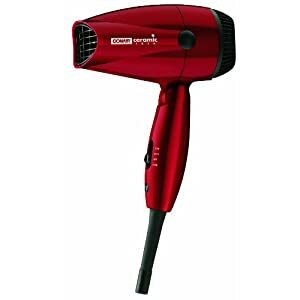 We do need to replace our current hair dryer. I'd love to try the Infiniti Nano Silver by Conair™ Tourmaline Ceramic™ Cord Reel Hair Setter. Long name for some hot rollers! I like the polished chrome illuminated mirror. I love the multi-functioning styling iron! I didn't realize they make so many things. I'd love to try their Handheld Clothing Steamer. I'd love to try the Infiniti by Conair® You Curl too. Would like to also try their Pollenex® 4 Settings: Gel Grips™ Handheld Showerhead. Thanks! I'd also like to try the Xtreme Instant Heat™ Multisized Hot Rollers. Hi! I am also interested in the Infiniti by Conair® You Curl model: CD117! I sent you a Facebook friend request! Following you on NetWork Blogs! I would also love the Infiniti by Conair You Style Multi-Functional Styling Iron. What a blessing it would be for my hair. I would like a straightner! I see they also have Haircutting kits...I want to learn how to! I also the Infiniti Nano Silver by Conair™ High Temperature Ionic Steam Straightener! I follow you through Network Blogs. I would love to try the Xtreme Instant Heat™ Multisized Hot Rollers. model: CS54 also looks nice. I love the instant heat compact hot rollers! Weight Watchers by Conair Glass Body Analysis Scale. The Ladies' Grooming System looks great. I would also love to get the Ultra Cut™ Rechargeable Cord/Cordless 21-Piece Haircut Kit with Turbo Charge---I've starting cutting my son's hair, so I would love a nice kit! I love the Pink Cheetah staightener! I also like the Thinner Digital Glass Scale #TH315. I like the MiniPRO® You Style 2-in-1 Ceramic Styler. I like their 13-Piece All-In-One Grooming System. I would love the Number Cut Haircutting Kit to keep my husband's hair looking tidy! I also like the Xtreme Instant Heat Hot Rollers from Conair. I'd love to save some dough using the 23 piece ultra cut haircutting kit! I Like the The Power of Pink Infiniti by Conair You Curl Curling Iron.